It’s subtraction time! Mort has overeaten and now has a bad stomach ache. 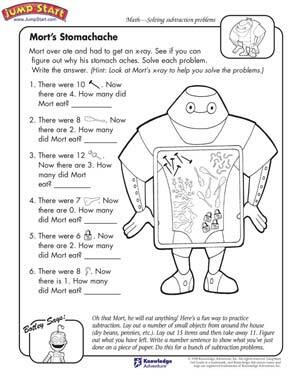 ‘Mort’s Stomachache’ is a simple subtraction worksheet for kids with subtraction word problems that they need to solve. The worksheet also has a representative diagram to help the little ones complete the worksheet with ease!